CONCISE HISTOLOGY, by Leslie P. Gartner, PhD and James L. Hiatt, PhD, thoroughly reviews all the histology knowledge required for the USMLE Step 1 in an easy-access outline format. Designed for students who need to learn a large amount of material in a limited time, it presents key information in a readable, concise manner, accompanied by full-color illustrations that clarify complex concepts. Online access via Student Consult includes an online testing centre providing students with class style tests using electron and photomicrographs, cross referenced to the corresponding sections of the textbook. 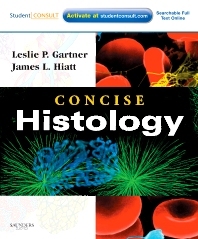 Efficiently absorb each topic through a self-contained two-page spread: one page of concise text, and a corresponding page of carefully selected, full-color illustrations – mostly from Gartner & Hiatt’s Color Textbook of Histology 3rd Edition. Access the full text online at studentconsult.com, and test your knowledge with an online testing centre providing students with class style tests using electron and photomicrographs, cross referenced to the corresponding sections of the textbook. See the relevance of histology to the practice of medicine with the aid of clinical consideration boxes interspersed throughout the text. Gain a rich and accurate understanding of histology thanks to the expertise and skillful teaching style of bestselling authors Drs. Gartner and Hiatt.